While the month of October often conjures images of bright pumpkins, vibrantly hued falling leaves, spiced apple cider and Halloween costumes, it also celebrates Vegan MoFo. What is Vegan MoFo you ask?? 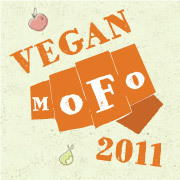 No, it doesn’t stand for vegan motherf***er, the conclusion my dirty-minded-potty-mouth might come to. It stands for the Vegan Month of Food!! Huzzah! Created on the Post Punk Kitchen, a badass vegan site started by the incomparable vegan duo Isa Chandra Moskowitz and Terry Hope Romero, Vegan MoFo celebrates vegan food throughout the month of October. Inspired by NaNoWriMo, National Novel Writing Month, the goal of Vegan MoFo is to write anything and everything about vegan food…vegan recipes, a love affair with tomatoes, your fave vegan restaurant…each weekday, all month-long. I missed the start of Vegan MoFo, no surprise as I can be quite the procrastinator (confession…time management is my nemesis!). But as the Vegan MoFo website states that you should aim to write at least 20 entries, I’m going to try my damndest to catch up and blog each day. While a daunting task, I do possess a pretty big mouth and have a lot to say, er, write. You should also definitely check out Vegan MoFoers and Vida Vegan Con attendees Madcap Cupcake and Le Chou Sauvage, two of the nicest vegan bloggers and amazingly fabulous photographers. Seriously their food pictures will make you drool. So here’s to celebrating decadent and delectable vegan food! Tags: food, vegan, Vegan MoFo. Bookmark the permalink.